Sucrine is a French heirloom variety of lettuce known for its succulent sweetness and crisp texture. Substitute romaine lettuce if unavailable. 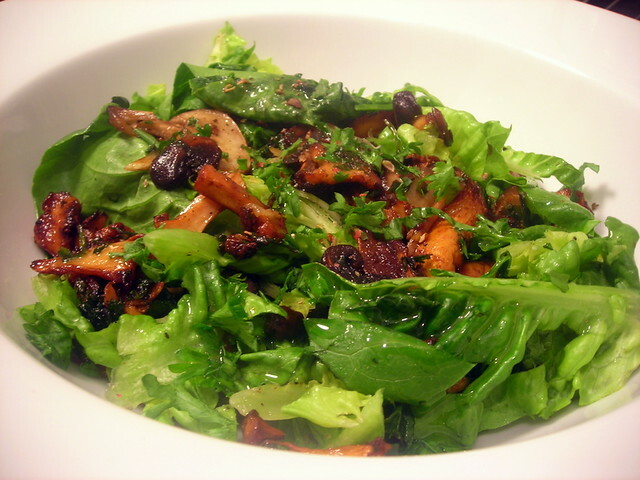 The creminis and chanterelles were sautéed in unsalted butter, along with rocambole garlic, sea salt and black pepper; dressed in lemon juice and chopped parsley; then tossed with chopped sucrine lettuce and finished with a drizzle of extra-virgin olive oil. 16 Jul	This entry was published on July 16, 2012 at 5:43 pm. It’s filed under food, food photography, Gluten-Free, summer, vegetarian and tagged food photography, gluten-free, lettuce, mushrooms, salad, summer, vegetarian. Bookmark the permalink. Follow any comments here with the RSS feed for this post.